This book describes several ways to improve drug localization and to increase anti-tumour efficacy, such as through drug modifications and through the development of anti-tumour drug delivery systems. Anticancer drugs have little or no specificity, resulting in low tumor concentrations, systemic toxicity and severe side effects. 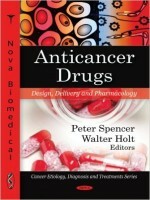 The pharmacological inhibitors of Hsp90, a major cytosolic chaperone, are examined in this book since they are often used in anticancer therapy. Furthermore, polyphenols, an anti-cancer agent which constitutes the most abundant group of antioxidants of normal human food, is discussed as well. Polyphenols protect against oxidative stress and their associated pathologies include inflammation, cancer and coronary heart diseases. Thus, they play an important role as an anticancer agent. Finally, metal-based antitumor drugs, which play an essential role in clinics today are reviewed. In particular, ruthenium compounds as promising alternatives to platinum-based anticancer drugs.